This page contains information for the X-Series "Rock Race/Crawler" auxiliary wire mode. This feature is available on firmware version V2.02 and newer for the Mamba Micro X, Mamba X, Mamba Monster X and Mamba XL X ESCs. This auxiliary wire mode is designed to allow users to get the most out of their ESC when used in rock racing or rock crawling vehicles. This mode allows the user to switch between two different 'Reverse Type' modes on the fly: ‘Rock Race Mode’ and ‘Crawler Mode’. ‘Rock Race Mode’ is optimized for either racing/bashing and ‘Crawler Mode’ is optimized for rock crawling. It also allows you to adjust the motor's Drag Brake based on the AUX wire signal. While in this mode the motor’s Drag Brake percentage is controlled by AUX wire signal. At 1.1ms the Drag Brake will be disabled at 0% and at 1.9ms the Drag Brake will be set to 100%; it is proportional throughout the AUX wire signal range; IE at 1.5ms the Drag Brake will be at 50%. The ‘Reverse Type’ in this mode will be set to the Castle Link ‘Reverse Type’ setting on the Basic tab (default is set to “With Reverse”) Refer to "Reverse Type Definitions" at the end of the document for a full description of each ‘Reverse Type'. Note: Do not set 'Reverse Type' to "Crawler Reverse"; this will not allow you to switch reverse modes, use only "With Reverse" or "Without Reverse"
The ‘Reverse Type’ in this mode will be set to “Crawler Reverse”. Refer to "Reverse Type Definitions" at the end of the document for a full description of “Crawler Reverse”. There is a point on the AUX wire signal that will switch between the 'Rock Race Mode' and 'Crawler Mode'. This point is adjustable and is controlled by the Castle Link ‘Drag Brake’ setting on the ESC. When the AUX wire Drag Brake value is at or below the Castle Link 'Drag Brake' setting it will be in 'Rock Race Mode'; when the AUX wire Drag Brake value is above the Castle Link 'Drag Brake' setting it will be in 'Crawler Mode'. Please see the examples below for a better understanding of how this works. Note: If the AUX wire becomes disconnected, the controller will default to 'Rock Race Mode'. 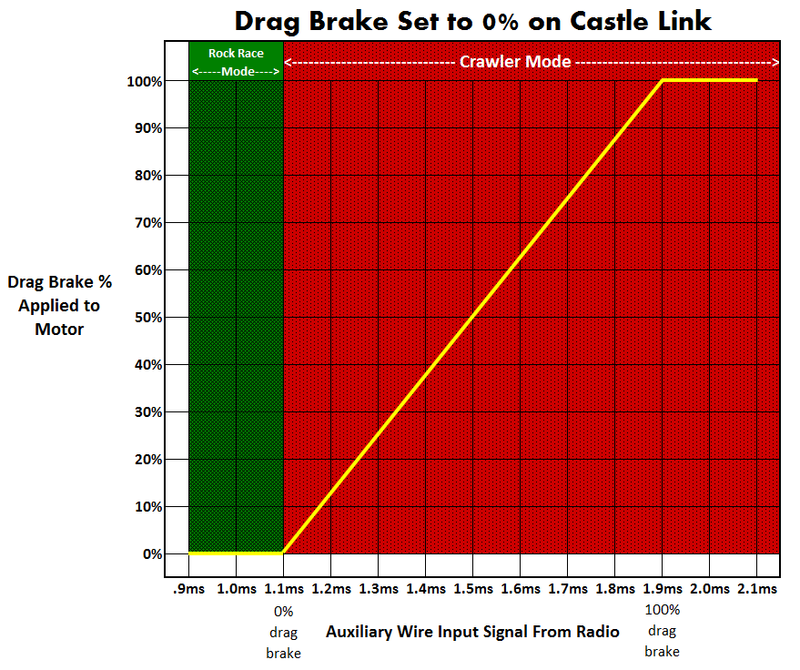 Castle Link Settings: 'Drag Brake' - "0%", 'Reverse Type' - "Without Reverse"
‘Rock Race Mode’ is enabled whenever the AUX Wire Drag Brake is at or below 0% (≤ 1.1ms) and the 'Reverse Type' will be set to "Without Reverse". ‘Crawler Mode’ is enabled whenever the AUX Wire Drag Brake is above 0% (> 1.1ms) and the 'Reverse Type' will be set to "Crawler Reverse". 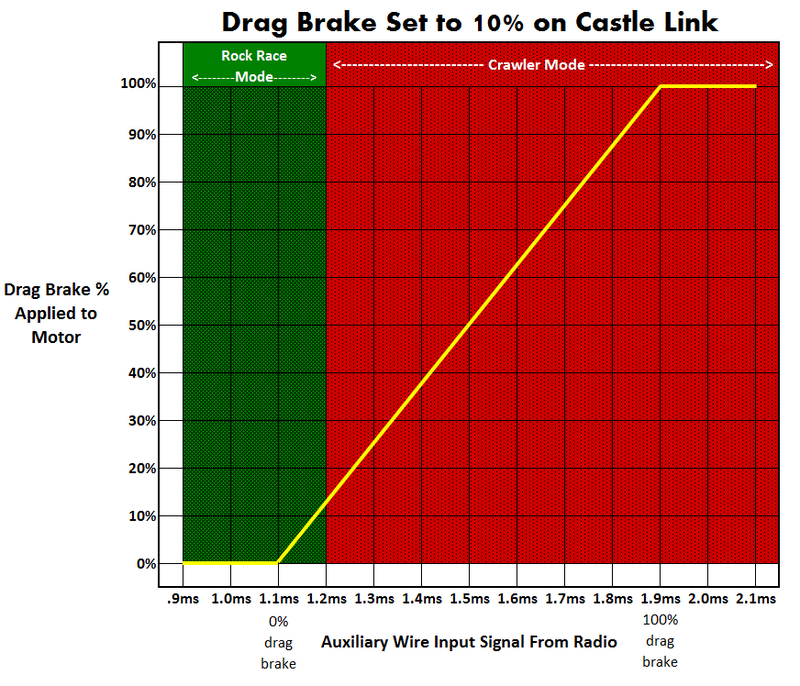 Castle Link Settings: 'Drag Brake' - "10%", 'Reverse Type' - "With Reverse"
‘Rock Race Mode’ is enabled whenever the AUX Wire Drag Brake is at or below 10% (≤ ~1.2ms) and the 'Reverse Type' will be set to "With Reverse". ‘Crawler Mode’ is enabled whenever the AUX Wire Drag Brake is above 10% (> ~1.2ms) and the 'Reverse Type' will be set to "Crawler Reverse". 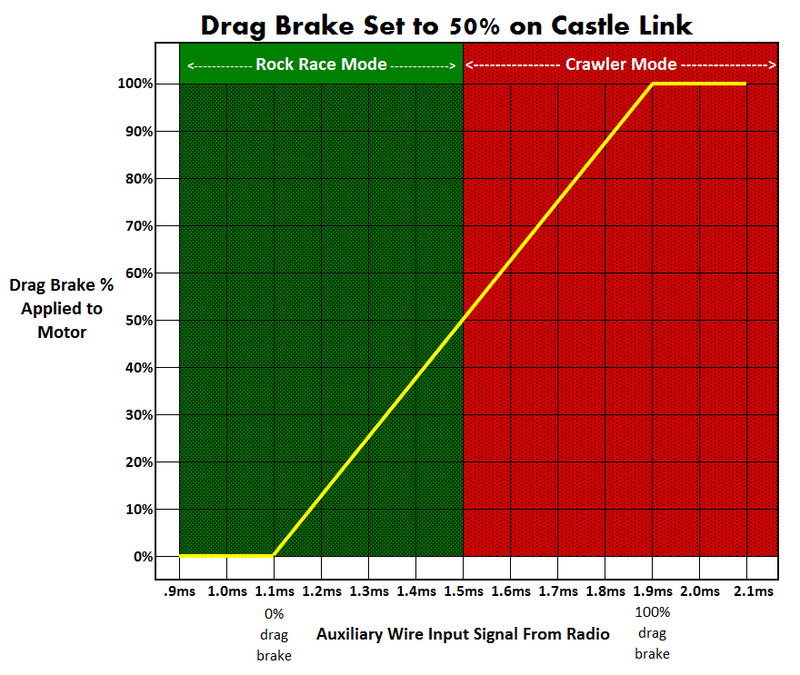 Castle Link Settings: 'Drag Brake' - "50%", 'Reverse Type' - "With Reverse"
‘Rock Race Mode’ is enabled whenever the AUX Wire Drag Brake is at or below 50% (≤ ~1.5ms) and the 'Reverse Type' will be set to "With Reverse". ‘Crawler Mode’ is enabled whenever the AUX Wire Drag Brake is above 50% (> ~1.5ms) and the 'Reverse Type' will be set to "Crawler Reverse". "Without Reverse" - Racing Setting. No reverse motor direction. Pressing the reverse trigger on the radio will engage the motor brake. "With Reverse" - For bashing or racing (may not be allowed in some racing situations). When transitioning from throttle to reverse the ESC will brake the motor. To run in reverse the ESC must see a neutral signal for at least 2 seconds before the reverse will engage when reverse trigger is applied. "Crawler Reverse" - The ESC will immediately spin the motor in reverse when the reverse trigger is pressed. The ESC will apply a brake to bring the motor RPM to zero before reversing the motor; this helps prevent potential damage to the vehicle's drivetrain. This setting is recommended for low speed rock crawling; using this mode at high speed will result in an amazing front-flip, but expensive repairs.